When replying to an e-mail a dialog sometimes pops up asking if you want to send the mail Plain Text or HTML. This dialog doesn't fit its own window. See the attached screenshot. Thank you for submitting this bug and reporting a problem with size of dialog box in Thunderbird. You made this bug report in 2013 and there have been several versions of Ubuntu and Thunderbird since then. I can't recreate the original dialog but as can be seen from the attached screenshot: the same problem is visible in the preferences window. Since filing this report I have moved to Xenial and MATE. Yes, you are right. 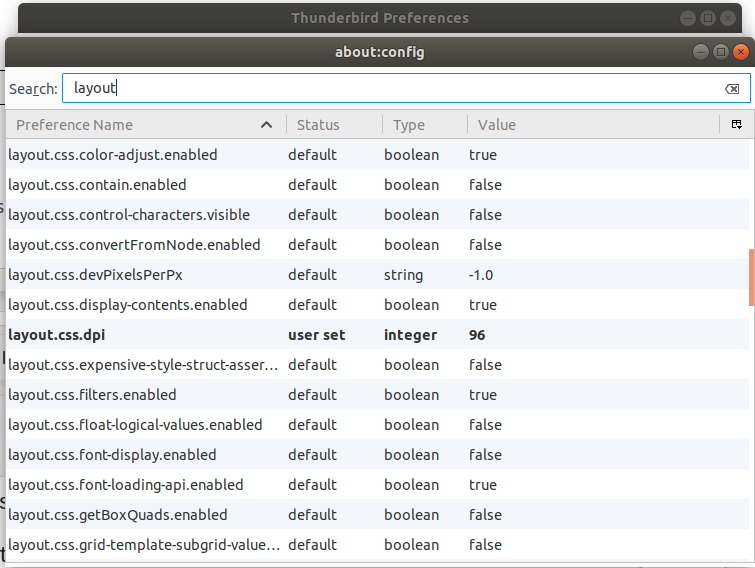 In my Thunderbird, I can see that the preferences window is too small for the content, too. I will work on next steps (finding duplicates, status change). I found a duplicate report in the Mozilla "Bugzilla" website and it provides a solution. "This may be specific to the locale based on any strings being longer than in the en-US version. The other option may be that your DPI value is wrong and thus the fonts larger than intended. If you go into the Advanced > Config Editor preference settings, find layout.css.dpi and set it to a default of 96 by double-clicking on that entry. If this doesn't work, reduce that value to shrink the sizes. I've seen cases where KDE passed a wrong DPI value down to Thunderbird and therefore caused issues with the dialog display." Attached is the screen print of my DPI settings before I changed it and you can see that it is set to "-1"
I will attach another screenshot to the next comment, of the settings after I changed it to 96. And the new setting makes the items in my preferences window smaller and so now everything fits in the window. Here is the screen shot after the change. My locale is en_GB so there should be very little difference to en_US. I tried en_US nonetheless and the result is the same. I tried various DPI settings but they all made no difference. I've never used KDE. The Mozilla bug is ancient so I'd be surprised if the code isn't vastly different since then. I'm amazed nobody else seems to have the issue. I haven't changed anything from the default install other than screen resolution, which also doesn't make a difference. Given the shape of the window I suspect it is something other than locale/text that is the issue. I wonder if it is related to libgtk2.0. 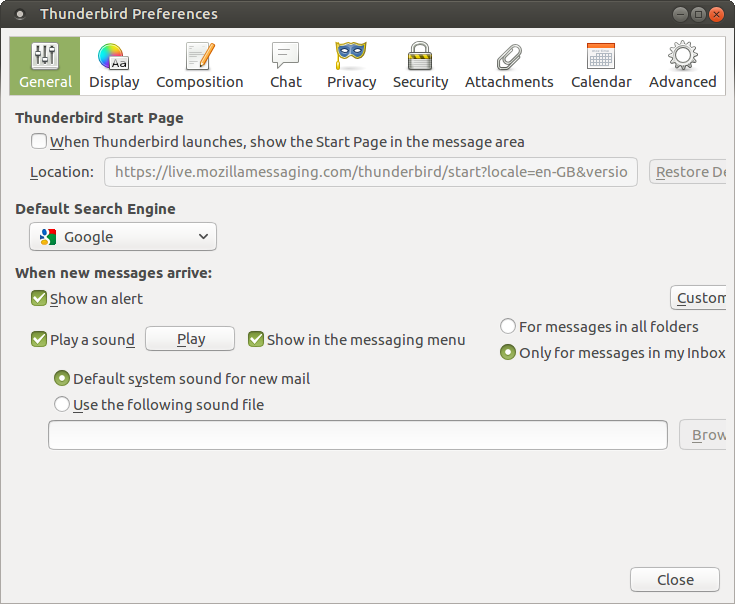 The original bug against Gnome 2, and now against MATE, both rely on libgtk2, but Thunderbird now relies on libgtk3. However: that's all a guess and I would expect other apps to be affected. I tried Firefox but they appear to have done away with dialog windows in favour of web pages. The bug team suggest that I create a ticket again on the Mozilla Bugzilla website (since the other ticket is closed). 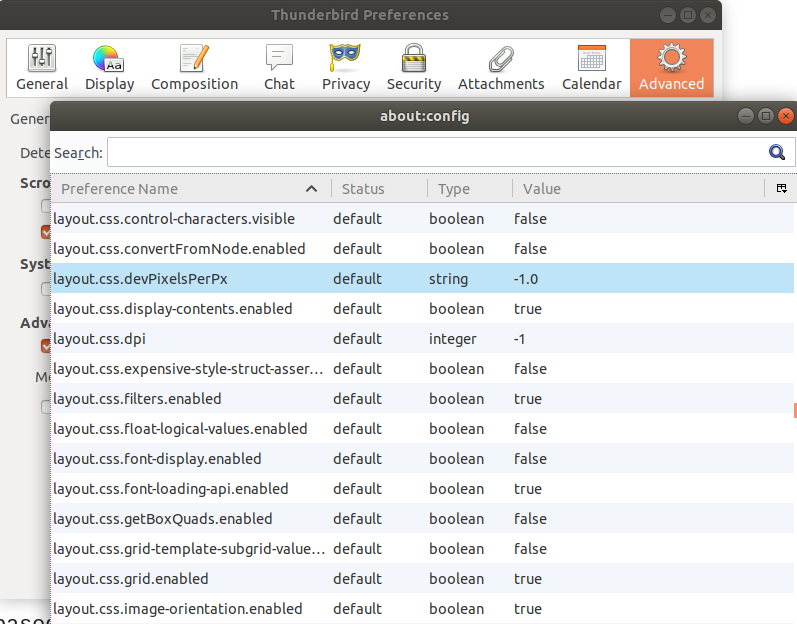 Can you tell me what version of Thunderbird you have? I just got upgraded to 52.9.1 and I can't replicate the problem anymore. I tried changing my dpi setting back to "-1" as it was originally but the preferences window still looks fine. Hi Ken. I just realized that the workaround of changing the DPI setting did NOT work for me either. I was looking at the advanced tab (which looks fine). The general tab still has things to big to fit the window. I am creating the bug upstream on Mozilla Bugzilla now. Original Mozilla Bug (502371) is closed. Was advised by bdmurray of the bug team to open another Mozilla Bugzilla bug. New bug ID is: 1476478. I have created an "upstream" bug report at the Thunderbird/Mozilla bug report site called Bugzilla. And I have linked that bug report to this one. This is as far as I can go on this ticket. I hope they action it soon. I tested this in Thunderbird version 60. General tab of Preference window is OK but now the ADVANCED tab has the problem of text and buttons being cut off on the right side of the window. I have updated the Mozilla ticket with additional comments and screen shots. They are able to replicate your issue and seem to have isolated the problem. In the meantime, they suggest to resize the window of the general tab, making it slightly wider. Are you able to do that? Can you try it again to see if it is still a problem? I am unable to replicate it anymore and the Mozilla team have closed the bug report at their end. Is it resolved for you, Ken? It is possible to resize the dialog here but I think it depends on your WM. No fix has arrived here on Xenial. I'll check Bionic asap and report back. Thanks for the update, Ken. And just to confirm, which window do you have a problem with? Is it the general tab or the adanced tab. What do you mean by "WM"?